Article by Atlanta journal Constitution. Warm Springs — On an annual day of presidential remembrance, a girl one day shy of her first birthday provided a glimpse of the future. Somewhere, Franklin Delano Roosevelt was surely smiling. Here, Robert Young glowed. As the audience outside the Little White House dispersed Wednesday, the LaGrange man plopped daughter Savanna Lynd beside a small sculpture of a seated Roosevelt. “That’s great!” cried Martin Dawe, the Atlanta sculptor who captured FDR in miniature. As a sitting president. As a polio victim. By next April 12, when the 62nd anniversary of Roosevelt’s death will be commemorated, Dawe’s life-size statue of FDR will be unveiled. It will be historically accurate, the only Roosevelt statue that depicts his paraplegia in detail, right down to the leg braces he wore. “It differentiates this from every other statue of the president,” said Dan White, 56, of Atlanta, who went to high school 30 miles east of here in Yatesville and conceived the idea for the statue. The sculpture is a statue of liberty of sorts. It illustrates the freedom FDR felt here to simply be himself. In Washington, in his role as the nation’s only four-term president, architect of the New Deal and commander in chief through nearly all of World War II, Roosevelt felt the need to camouflage his disability. To avoid being seen or photographed in a wheelchair, in order to project strength. Elsewhere, Roosevelt always hid his leg braces under his pants. Here, he strapped on the braces outside his pants, in plain view. Just like all the other polio patients who came to Warm Springs for treatment and to bathe in the soothing 88-degree spring waters that brought them some relief from polio’s racking pain. Once a $100,000 fund-raising campaign is completed (nearly $40,000 has been raised toward paying Dawe’s fee and for the statue’s site preparation and improvements), it will take Dawe six to eight months to sculpt the life-size FDR statue. It will be cast in bronze at an East Point foundry, after miniatures are sold to raise funds, and unveiled next April in nearby F.D. Roosevelt Park atop Pine Mountain. Unlike the debate in Washington over whether to present FDR in a wheelchair in the Franklin Roosevelt Memorial there, there was no controversy here in his personal Eden — Dowdell’s Knob, the rock outcropping overlooking Pine Mountain Valley, where Roosevelt would picnic with friends and ever-present Secret Service agents and savor the view, cook burgers on an old Civilian Conservation Corps stone grill or contemplate the perils of fascism and World War II. All while seated on a car seat, which agents would remove from Roosevelt’s roadster and place on a rock atop Dowdell’s Knob. Soon, visitors will be able to sit beside his statue and smile for a presidential photo op. FDR is on the right side, gazing out upon the lush Pine Mountain Valley below. “This is pretty much the exact view the man had when he contemplated developing a lot of the programs we have today,” Dawe said. “The New Deal. Great social changes. The CCC. The WPA. Social Security. And then World War II. 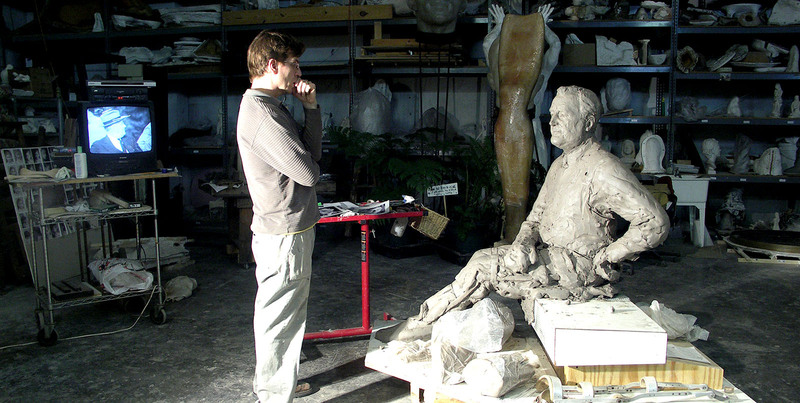 Dawe, whose CherryLion Studio is the state’s largest custom sculpture studio, was one of four sculptors asked to submit FDR proposals in 2002. He and two others applied. “We felt like Marty really captured Roosevelt’s essence the best,” said White, a member of the project’s advisory committee. When Dawe sculpted his first clay model of FDR, he made one error. “I put the braces on backwards,” he recalled. A staffer at the Little White House corrected him: “No, it [the lacing] goes on the other side.” The artist has since studied Roosevelt in depth and come to appreciate the president’s affection for Dowdell’s Knob. “It’s a magical place that makes you feel contemplative just by its nature,” Dawe said. It’s where Roosevelt, who made 41 trips to Warm Springs from 1924 to 1945, spent two or three hours alone on the knob the day before dying of a cerebral hemorrhage on April 12, 1945. Last Monday, as Dawe stood in his studio and spoke of changing head angles and hand placements and which leg to cross over the other while trying to sculpt one of the 20th century’s towering figures, he stopped in midsentence. It dawned on him: His oldest sister, Nikki, came down with polio at age 3. Ken and Moyra Dawe tell the story of how they, two Londoners, met while serving in the Royal Navy. How she was sent to Durban, South Africa, to teach gunnery. How they met there, became engaged and married. How Moyra gave birth to Nikki, the first of their five children (Martin was the third). How a U.S. cargo ship docked at Durban in 1954, the year before Dr. Jonas Salk developed the polio vaccine. “One of the crewmen had polio,” Ken recalled. The disease spread through Durban. Nikki was stricken with polio, her parents with fear. For six weeks, every day, Ken went to the hospital, “to the main gate, and I left a toy for her and asked them to tell her we loved her and missed her. After the Daweses moved to the United States, Nikki became a nurse. She died of breast cancer at age 51 in 2002 — shortly before her brother was approached about doing a statue of Franklin Delano Roosevelt, president and polio survivor. Moyra said she was “absolutely thrilled” that Marty felt there was a connection between his latest work and his sister. Perhaps she’s teaching still. Guiding her brother the sculptor, helping him capture FDR in detail. As Ken said, “His sister’s leaning over his shoulder and saying, ‘Hey, Martin, you’ve got to do that a little differently. This is what happens to the leg muscles. Thanks for leaving an awesome reply!